A Pro Infinity, a Plus or a Pro Subscription License is required to fully use the Pioneer DDJ-SB2 Without any of the above Licenses, the controller will operate for 10 minutes each time you restart VirtualDJ. A detection window will appear next, asking to use or not the pre-defined audio setup with the built-in sound card of the DDJ-SB2. 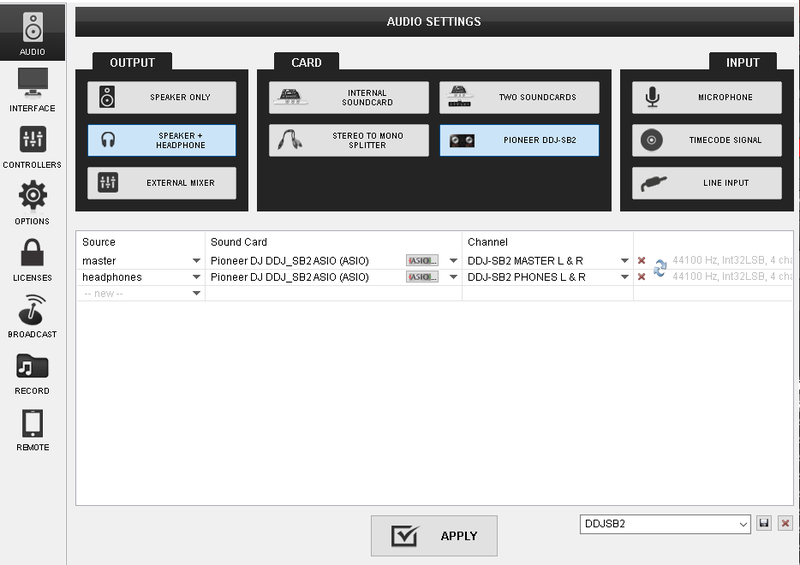 Select “Use Soundcard” in order VirtualDJ to use the pre-defined DDJ-SB2 audio configuration. Select “Change Skin” to load the Default 4 Decks skin instead of the 2 Decks one. The unit has a pre-defined Audio setup and a special button in the AUDIO tab of Config to provide that. When the pre-defined audio configuration is selected, speakers need to be connected to the rear Master Output connection (RCA cables) and your Headphones plugged to the rear Headphones socket of the DDJ-SB2.